Australian Native Plants: Propagation, cultivation and use in landscaping. Concise Edition Reprinted 2008. 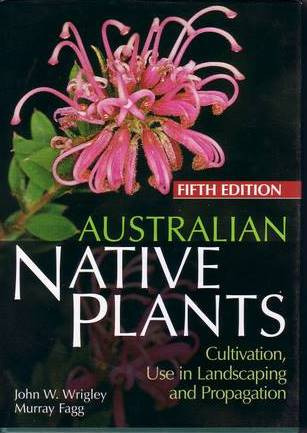 An excellent reference book for any Australian native plant enthusiast. A wealth of information on over 1800 native plants, their properties, cultivation and propagation(the 5th Edition has 3500 plants) The plant entries are divided into chapters according to whether they are Groundcovers, Water Features, Shrubs, Trees, Climbers, Annuals & Bedding Plants. Over 580 colour photographs and more than 170 line drawings.